Arrowhead Mills offers such a nice variety of organic foods that my food allergic/food sensitive kids can eat. One of our favorites is Organic Gluten Free Rise & Shine Hot Cereal. 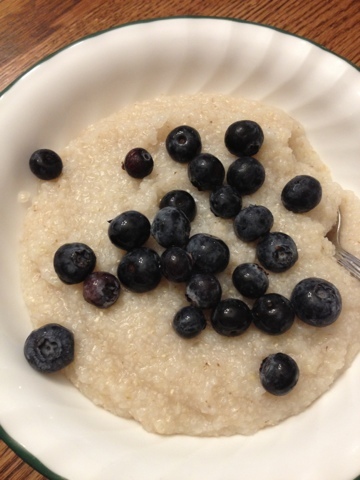 It has only one ingredient: organic brown rice grits. 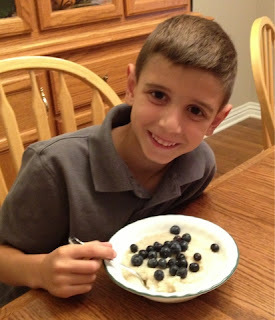 Bubs loves this stuff and would eat it every morning (if he wasn't on a rotation diet). Sometimes we top it with honey, agave, real maple syrup, raisins, fruit, or other flavorful toppings. Bubs' other favorite breakfast foods also come from Arrowhead Mills. He loves the dry cereal just as much as the hot cereal. One of his favorites is Puffed Rice. He will eat it with just some rice milk poured over the top. His bowl is usually overflowing with cereal he loves it so much. I would give him a bigger bowl, but that one would be overflowing as well. This kid can eat! Arrowhead Mills offers a large variety of organic food that are affordable and tasty in the following categories: baking, breakfast, gluten free, beans, grains, & seeds, stuffing mixes & sides, and nut butters. There are also some wonderful recipes on their website that you need to try. Who doesn't want to eat healthier? Who doesn't want to pay less and get more? Arrowhead Mills is a great company that offers such a wide variety of organic foods at an affordable price. I can find these products at my local grocery store in the healthy foods section or at my local natural grocery store. I can also order online allowing me to choose from all the products.